A few years ago, the federal government adopted grants reforms designed in part to improve the way governments at all levels treat nonprofits that perform services on their behalf. Notably, the reforms, known as the OMB Uniform Guidance, provide that nonprofits are entitled to be reimbursed by local, state, and federal governments for some or all of their indirect costs when federal money is in the funding stream. Is the promise of the OMB Uniform Guidance a reality in your state? We ask for your help to find out. The network of the National Council of Nonprofits is launching a short survey to get a better idea of what is happening in each state. If your nonprofit has government grants or contracts, please complete the Nonprofit Uniform Guidance Implementation Survey. Your individual responses will be kept confidential, but the results will help inform advocacy efforts at the state and federal levels. The House plans to vote the first week of September on a bill that combines in one piece of legislation all 12 appropriations bills - eight measures that have not yet come to a vote this year and four security-related bills that passed the House shortly before the beginning of the August recess. Once passed in the House, the new bill is expected to be largely ignored in the Senate because it contains many controversial issues, such as funding for construction of a U.S.-Mexican wall and extraneous riders such as a provision that would make it virtually impossible for the Internal Revenue Service to enforce the Johnson Amendment against even the most egregious partisan electioneering activities of churches. Further, the Congressional Budget Office reported that the House spending bills exceed the budget caps by $72 billion, setting the stage for automatic, across-the-board cuts at the end of the year, known as “sequestration,” unless a bipartisan agreement can be reached to raise the caps. For its part, the Senate Appropriations Committee has approved six of its 12 spending bills and there is little floor time in the Senate for consideration of the individual measures. Most observers expect that Congress will need to pass a stopgap spending bill, known as a continuing resolution, to keep the government funded when the new fiscal year begins on Oct. 1, and return to the tough decisions on FY 2018 funding later in the Fall. See August 7 edition of Nonprofit Advocacy Matters for a more detailed listing of fiscal issues facing Congress in September. Is Congress Getting Serious About Tax Reform? With action on repealing and replacing the Affordable Care Act set aside for the time being, Congress appears to be focusing genuine interest in enacting significant tax reform legislation. In late July, House and Senate leaders, tax committee chairmen, and chief economic policy leaders in the Trump administration issued a statement of shared principles designed to lay the groundwork for comprehensive tax reform. Significantly, the statement rules out the controversial “border adjustment tax” proposal that would have imposed $1 trillion in taxes on imports, and in doing so removes a major impediment to bringing Republicans together in a unified position on tax reform. The joint statement calls on the tax committees to develop legislation this fall, and it expresses the hope that Democrats will participate in the effort. Also in recent weeks, 43 Senate Democrats and two Independents sent a letter outlining their conditions for working with the administration and congressional Republicans on tax reform, insisting that tax laws not increase the tax burden on the middle class or lower taxes on the wealthiest taxpayers, that the ultimate reform package not add to the deficit, and that no revenue savings are reaped by reforming entitlement programs and cutting benefits to individuals. Those conditions may be too strict to garner bipartisan negotiations, but the parties are making overtures that have been absent since the healthcare debate started in January. Overtime Rules in Limbo – Nonprofit Action Needed: The U.S. Department of Labor has published a Request for Information (RFI) in the Federal Register seeking comments from the public about how the white-collar exemption from overtime pay under the Fair Labor Standards Act should be updated. The deadline for submitting comments is Monday, September 25. For more information, including background on current law and annotations that explain several of the questions presented in the RFI, see the National Council of Nonprofits analysis, Labor Department Reopens White-Collar Salary Exemption for Comments. Ending Federal Health Care Subsidies: Health insurance premiums would rise by an average of 20 percent next year and the federal deficit would increase by $194 billion over the next decade if the Trump administration follows through with its threat to cut federal cost-sharing subsidies, the Congressional Budget Office and Joint Committee on Taxation reported last week. The cost-sharing subsidies are paid directly to insurers to help cover out-of-pocket costs, such as deductibles and copayments, for about 7 million individuals who earn between 100 and 250 percent of the federal poverty level and who choose a marketplace silver plan. OMB Updates Uniform Guidance FAQs: The federal Office of Management and Budget provided some clarity to the law governing federal grants when it issued its latest version of answers to Frequently Asked Questions (FAQs). The OMB Uniform Guidance mandates that governments at all levels reimburse nonprofits for their indirect costs, providing that nonprofits that have never negotiated an indirect cost rate with government are entitled to reimbursement of a de minimis rate of 10 percent of modified total direct costs. The FAQ explains that governments cannot use the de minimis rate as an automatic top rate; it’s the minimum they must pay, but nonprofits can use their higher federally approved rates. The FAQs also definitively answer whether a nonprofit that has elected to use the de minimis rate must subsequently provide documentation to support it. The answer is an unequivocal, no. Nonprofits with government grants and contracts are encouraged to complete the Nonprofit Uniform Guidance Implementation Survey, discussed above. IRS Advisory Committee Openings: The IRS is seeking applicants for vacancies on the Advisory Committee on Tax Exempt and Government Entities (ACT). The committee provides advice and public input on the various areas of tax administration served by the Tax Exempt and Government Entities Division (TE/GE). Applications will be accepted through September 18, 2017. In the face of revenue shortfalls and ongoing political disagreements, states are confronting unbalanced budgets more than seven weeks after the beginning of the fiscal year. Connecticut lawmakers still have not enacted a budget for 2018-2019 and, under that state’s constitution, the Governor is empowered to make unilateral spending decisions by executive order. Governor Malloy announced on Friday that he is reducing state grants to local school districts by 28 percent, while restoring $40 million to services and programs provided by community nonprofits. The Governor explained that nonprofit service providers have not been able to withstand continued cuts without unacceptable reductions in services. The CT Community Nonprofit Alliance joined with many nonprofits in saying that the restoration of funds, while needed and appreciated, shouldn’t be seen as an alternative to the Legislature ending the political standoff and enacting a biennial budget. Learn more about the revised spending allocation plan in Connecticut. Pennsylvania has enacted a spending plan for the fiscal year, but a revenue bill is still needed to close a $1.5 billion gap from the prior year and a projected upcoming deficit of $700 million in a $32 billion budget. Earlier this month, Pennsylvania's Treasurer approved a short-term $750 million loan to cover payroll for public sector workers as lawmakers struggle to close the large budget gap. Oklahoma’s Governor is calling the legislature back in special session to address a projected $215 million budget short fall. Cuts are expected in three state agencies, all of which work directly with charitable nonprofits to deliver services to the public: Department of Human Services, the Department of Mental Health and Substance Abuse Services, and the Oklahoma Health Care Authority. Nonprofits in Illinois are well aware of the impact that political actions and inactions can have on their ability to deliver services. In Damage Done, an analysis of the two-year budget impasse, the Chicago Foundation for Women documents that 30,000 fewer children were receiving child care, 34 percent fewer women received breast cancer screenings, 3,600 adults and 4,200 children seeking shelter because of domestic violence were turned away, among many other findings. A dozen states seeking work-mandate waivers for their Medicaid programs received encouragement this month in a letter from the Secretary of Health and Human Services and the Centers for Medicare and Medicaid Services (CMS). The states have petitioned CMS for approval of pilot programs of Medicaid expansion to require adults to be working for eligibility, unless they are pregnant, have a disability, or are elderly. Although the Governor of Pennsylvania reportedly is opposed to mandating a work requirement, a bill in the Legislature would require state officials to seek a waiver to add the mandate for some Medicaid beneficiaries. In the view of some, a work mandate for healthcare contradicts the purpose of the waivers to “increase and strengthen overall coverage of low-income individuals” by making access even more difficult. In the past, Kentucky and other states unsuccessfully sought waivers that include volunteering with charitable nonprofits as part of a work requirement, a condition sometimes called “mandatory volunteerism,” because they sought to condition public benefits on fulfilling community services that may or may not be sought by the nonprofits. Fees: Zoning approval of a multimillion dollar expansion of the Cincinnati, Ohio, Children’s Hospital Medical Center was supposed to be a foregone conclusion this month, yet two City Councilmembers, one of whom is challenging the incumbent Mayor in the next election, offered a surprise motion to extract an additional $14 million in payments to revitalize the impacted community. The next day the hospital sent a strongly worded letter to the Mayor and City Council laying out the extensive community service and funding it already provides the community and calling the surprise motion “highly disappointing” and “not acceptable.” The motion ultimately failed on a 4-5 vote. Street Maintenance Fee: The Abilene, Texas City Council failed to pass a street maintenance fee that would have been applied to residential and commercial properties, including universities and nonprofit organizations. The vote on the $10 million plan for street maintenance and repairs was tied three to three, with one Councilmember absent, suggesting that the fee remains a threat for future action. Nonprofits in St. Paul, Minnesota successfully challenged a similar fee which the state Supreme Court last year agreed was not a “fee,” but an unlawful tax on tax-exempt organizations. More than 4,000 faith leaders from all 50 states made a clarion call last week, signing onto a joint letter to Congress declaring, “As a leader in my religious community, I am strongly opposed to any effort to repeal or weaken current law that protects houses of worship from becoming centers of partisan politics.” Religious liberty advocates and faith groups including Baptist, Catholic, Episcopalian, Judaism, Lutheran, Methodist, Muslim, Presbyterian, Metropolitan Community Church, Unitarian Universalist, and United Church of Christ, joined together to keep the current tax law protecting nonprofits and houses of worship from the rancor of partisan politics. Organizers of the letter, the Baptist Joint Committee for Religious Liberty (BJC), Americans United for Separation of Church and State (AU), and multiple religious groups, presented the letter to members of Congress on August 16, the anniversary of President Eisenhower’s signing into law the Internal Revenue Act of 1954 that included the Johnson Amendment, the provision that protects charitable nonprofits, religious congregations, and foundations from partisan electioneering. The organizers also capitalized on the drop off of the letter to raise awareness with an even wider audience regarding the threat of losing the Johnson Amendment protections. The drop off was captured on Facebook Live and on social media via #JohnsonAmendment. Some of the most heartening of all these actions lie within the truth and belief expressed by faith leaders themselves. The comments and pleas to protect their congregations, communities, and churches from the rancor and problems of partisan electioneering clearly define the adverse impact any repeal or weakening would have. Faith leaders who haven’t joined yet are encouraged to sign the letter and find out more about the advocacy efforts to protect houses of worship. The fundamental of nonprofit nonpartisanship is under attack in Congress. Join nearly 5,500 organizations – charitable nonprofits, religious institutions, foundations, and for-profits from across the country – by signing the Community Letter in Support of Nonpartisanship. Learn more at www.GiveVoice.org. - Christine Nardi, Center for Nonprofit Excellence in Charlottesville, Virginia, expressing the sentiments of the residents of the city wracked by a violent demonstration by white supremacists on August 12, 2017. - Janetta Cravens, M. Div., “The Time is Always Right to Do What is Right,” Oklahoma Center for Nonprofits Blog, August 16, 2017. Heather Iliff and Melissa Sines, Maryland Nonprofits, August 17, 2017. For more thoughts and comments, see “Bridging the Divide: The Role of Nonprofits,” in Nonprofit Knowledge Matters, August 16, 2017 and “’An Intolerable Failure’: How Nonprofits Responded to Charlottesville,” Chronicle of Philanthropy, August 17, 2017. - Retired pastor W.B. Moorer, “Keep the Churches Out of Politics,” Tulsa World, August 13, 2017, expressing strong support for the Johnson Amendment that protects houses of worship and all 501(c)(3) organizations from partisan pressure. - Reverend George Mason and Rabbi David Stern, A repeal of the Johnson Amendment would sadly bring politics into houses of worship, Dallas Morning News, August 15, 2017. - Dr. Bruce Prescott, writing in “Should congregations endorse political candidates?,” Oklahoma City Oklahoman, August 18, 2017, expressing strong support for Johnson Amendment. Permanently Driving Off Donors (and What You Can Do to Prevent It! ), Tim Delaney, President and CEO of the National Council of Nonprofits, writing in GrantStation Trend Track, August 7, 2017, identifying the negative impact on donors and nonprofits if the law on nonpartisanship (Johnson Amendment) were to be weakened or repealed. The Debt-Ceiling Crisis Is Real, Edward Kleinbard, New York Times, August 7, 2017, providing expert analysis on the true cost to taxpayers if Congress fails to raise the federal borrowing limit and the government is forced to default on its debts. GOP tax plans pose $13 billion threat to charitable giving. Will lawmakers listen?, Brian Walsh of Faith & Giving Coalition, writing in Philanthropy Daily, August 9, 2017. Of and For the Community, League of American Orchestras, August 2017, providing a detailed look at the education and community engagement (EdCE) work of orchestras covering the period of 2009 to 2014, including analysis of the extent of school and community partnerships developed. Also read the excellent article on nonprofit advocacy, “Speaking Up for Orchestras,” by Heather Noonan. It’s August: Let’s Advocate (4:29), webinar by the Minnesota Council of Nonprofits, August 2017, providing four easy action items all people committed to a nonprofit’s mission can take to engage with their elected federal officials during Congress’ August recess. 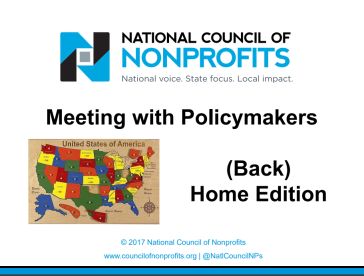 Meeting with Policymakers: (Back) Home Edition, National Council of Nonprofits, August 2017, offering advice on setting up meetings with state and federal policymakers in their district/state offices while on recess. The number of states, plus the District of Columbia, that permit citizen-generated ballot initiatives as a way for voters to enact or change laws. Source: Lawmakers Strike Back Against Voter-Approved Ballot Measures, Elaine Povich, Stateline, July 28, 2017.